More food options have been appearing on North Beacon Hill lately in the form of some new food trucks. El Sabroso. Photo by Wendi Dunlap. El Sabroso opened several weeks ago, semi-permanently located in the corner of the El Centro parking lot, just north of Beacon Hill Station. 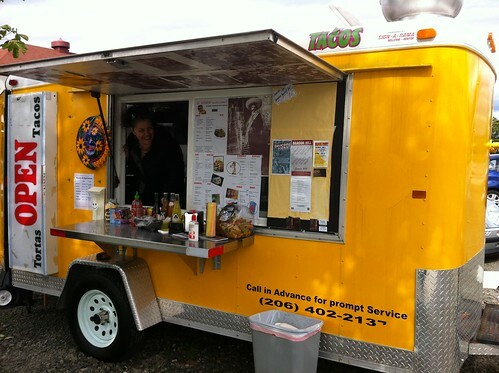 The truck is generally open until “three-ish” 7 p.m. daily, serving tacos and tortas that they describe as “the best Latin street food in Seattle!” Chef Daniel Pérez is also the Executive Chef at Tango Restaurant on Pike Street. Caravan Crepes. Photo by Allison Delong. 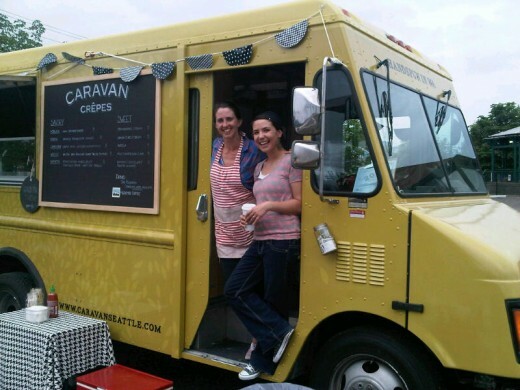 If you’re looking for something with more of a French flavor, neighbor Allison Delong reports that the Caravan Crepes truck will be visiting Beacon Hill Station from about 11 a.m. to 3 p.m. every Saturday. Here is the menu, which includes both savory and sweet crepes. Allison tells us that on Saturday afternoon a hot dog cart opened for business as well, so we had a full-fledged food court starting to happen on North Beacon! Keep your eyes on the area around Beacon Hill Station and the El Centro parking lot for more visits from these food trucks and carts.